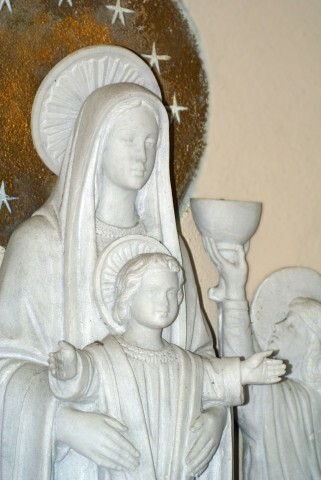 Can you recall a time when the Mother of our Lord came to you? For me she came often and by way of my own Mom, who’s always had a remarkable devotion to Our Lady. In fact while growing up, I don’t think a day passed without her proclaiming, “Mother Mary, with your Son, bless us each and every one.” She knew that the demands of raising five children would take the divine help of our Lord, but what she didn’t know was the effect the prayer was having on me, and how her constant reliance upon Mary’s grace would become a stronghold for us both in years to come. In writing this, I’d spent too much time searching the Catholic websites for the author of that prayer. Finally, I called my Mom to see if it had been written by one of the saints. I was surprised and delighted to know that the author of the illustrious prayer was my Mom – a prayer that was answered repeatedly and assisted us in all our needs. Each time the little prayer would pass my Mom’s lips, Mary would show herself a Mother and lead us to her Son. As children, we relied on her deep faith as she abandoned herself to Mary, and we knew for certain our Lord was with us. Now, the Mother of our Lord visits me regularly through my personal prayers and, without ever having ceased, through the daily, faith-filled petitions of my own devoted Mother. Mother of Jesus, be a Mother to my Mother. Amen.